During his General Conference report on January 11, Bishop Denis Casco of Mexico told this story when invited to mention prayer requests. “First, pray for my physical safety in Mexico. I was attacked a couple years ago in Mexico City while at a hotel. Three men came after me and held me down. I defended myself. There was a car stationed outside. Providently, a police car passed by, and they left. “They broke my upper arm, they hurt my head, and they hurt my back from kicking me. The policeman took me to the Red Cross and then to the justice office for my report. After being interviewed about the circumstances of the attack, they concluded two things: the three men had mistaken me for somebody else, or they wanted to kidnap me. “I didn’t want to stay in Mexico. I asked them to take me to the airport. I arrived at the international airport in Los Angeles and went to the emergency room. It took me six months to recover from my injuries. 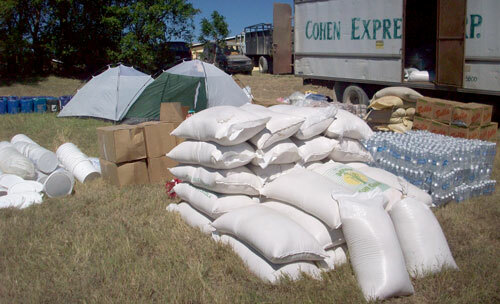 Relief supplies that have reached UB people in Haiti through CH Global. To date, UB churches in the United States have sent $67,233 to Global Ministries for Haiti relief. Here is the latest update from Jose Nunez of CH Global, an organization with which we are partnering in Haiti. It has been quite busy these last two days. Here are some of the developments. 1. Have met with a significant number of the children who had been enrolled into sponsorship. This morning we traveled to Delmas and were able to meet 12 of the children. More will be coming this afternoon. I hope I can get to meet with them all. 2. We have been blessed! Our supplies arrived from Disaster Relief yesterday. Pastor Oliam Richard and I, along with the other pastors, are working on the best method of distribution for the sponsored children. 3. Elsa (CH Global program director for Haiti) will be coming to take over shortly after my departure. She will be here next week after meeting me in Florida. 4. Pastor Richard and I have been working on establishing the daycare/education/counseling program. I will conclude and share all the details after meeting with Elsa in the States. 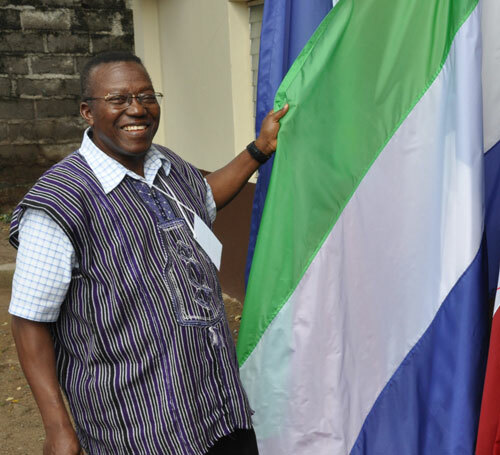 Billy Simbo, Bishop of Sierra Leone Conference, beside the Sierra Leonean flag. Billy Simbo, Bishop of Sierra Leone Conference, gave his report to the General Conference delegates on Tuesday, January 12. He returned to Sierra Leone two-and-a-half years ago to lead the conference in a transition to stability and renewal. The highest leader, formerly called the general superintendent, now carries the title “bishop.” The bishop is chosen for a five-year term, and can serve three terms (15 years). A Counsel of Elders, consisting of all ordained ministers (currently 28) selects the bishop. The conference must then ratify the selection. Superintendents are appointed by the bishop, rather than elected by the conference. Superintendents are appointed to functions, rather than geographic regions. The churches were divided into four regions—the same as the country’s four political regions (north, south, east, and west). Each region has its own leader. The regions are further divided into circuits. Each circuits has its own leader. If a vacancy arises, all of the ordained ministers get together, and anyone among them interested in the job presents his resume and vision for the church. When they have whittled down the candidates, this Counsel of Ordained Elders presents the candidate at the next session of the conference, which can then ratify the selection. Yesterday the new President of Honduras, Porfirio Lobo, was inaugurated while the former president, Manuel Zelaya, left the country bound for the Dominican Republic. We continue praying for the situation to normalize here in our country. There was little representation from other countries in this transfer of power, but we trust the Lord will help us to move forward. God is good. Praise his name! Our local congregations are very much in prayer for our brothers in Haiti. We are delighted to know that many have already committed to sponsoring children through CH Global. General Conference opened on January 10 with a Sunday afternoon service at the Bethel Institute in La Ceiba, Honduras. The service began with a parade of flags representing each United Brethren country and mission district represented at General Conference. That would be nine national conferences, plus Guataemala, Haiti, El Salvador, and Costa Rica. Honduran teenagers carried the flags, escorted by younger children clad in outfits symbolic of that country. 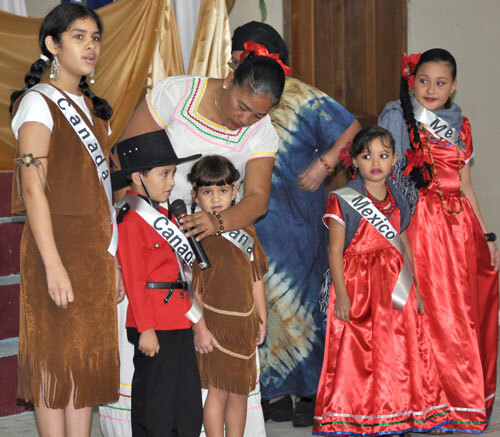 The flags were inserted into holders on the stage, while the younger children lined across the front. And then came this amazing part: those children took turns singing the national anthem of the country they were representing. The two children representing Mexico went first, then three for Canada, and on down the line. You could see General Conference delegates singing along, smiling with delight, when it was their country’s turn. Missionary Marilyn Reeck spearheaded this part of the program. You can imagine it was an incredible amount of work–making the costumes, finding recordings of the various national anthems, teaching Spanish-speaking children to sing those songs in other languages, etc. 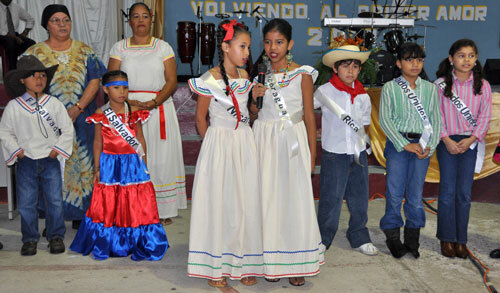 At the end came the Honduran national anthem, which really brought the local assembly alive. After finishing with the national anthems, the children then did several more songs before marching out. General Conference was off to a great start, thanks to the children of Honduras. Click on any thumbnail photo below to view a photo gallery of the children singing at General Conference. 27 Jan Yea, it’s got a HEMI! 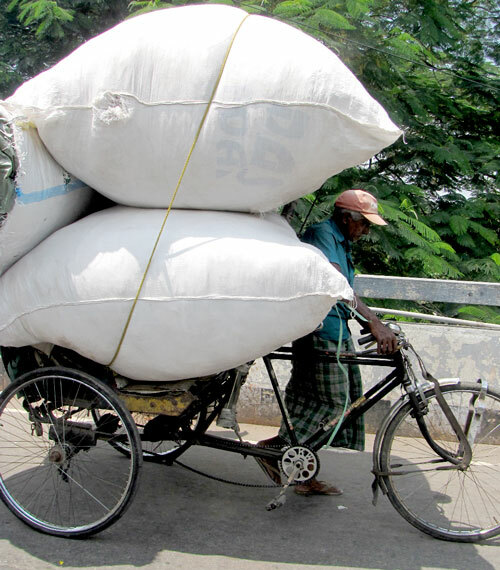 This is what you might call an “East Indian Pickup Truck.” I snapped this photo while in India last fall. I’m always amazed at how those in other cultures get by with so much less. However, I’m not sure I’m willing to give up my Tundra for one of these. Doug Birdsall grew up as a United Brethren preacher’s kid, the son of Roger and Marylou Birdsall. His brother Brent was a UB missionary and pastor, and Brian is a current UB endorsed missionary in Ukraine. 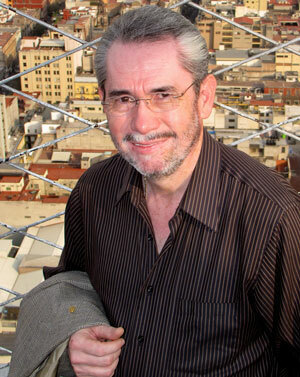 Doug is executive director of the Lausanne Committee for World Evangelization, which will be holding the Third Lausanne Congress on World Evangelization in Capetown, South Africa, in October 2010. This event will bring together 4000 leaders from over 200 countries to look at the future of the Church and world evangelization. A set number of persons can come from various countries (400 from the US). I received an email from Doug, which contains some fascinating information about China and India. Last month, I was in India and China to meet with the Lausanne leadership there. I’m looking forward with anticipation to meeting the exceptionally gifted and visionary leadership that is coming from countries such as these that will provide so much of the new leadership for global Christianity in the 21st century. The Chinese Lausanne leadership sees Capetown 2010 as a historic moment when the church in China will re-engage with the global church in the work of world evangelization. And, their delegation will be the second largest in the world with 250 people from every stream of the church in that country. It is also noteworthy that the 250 people from China and the 175 from India will be fully funded by sources within their own countries. Furthermore, the Indian church has committed to raise $1 million (US) for the Congress budget and the Chinese church has committed to raise $1.5 million (US). These are historic firsts in global Christianity for which we give God thanks. Here are some statistics compiled by CNN, using the most reliable figures they could find. 9 million: Population of Haiti. 3 million: Estimated number of people affected by the quake. 1 million: Estimated number of displaced people. 150,000: Latest estimate of the death toll (from the Haitian Health Ministry). The European Union and the Pan American Health Organization put the estimate at 200,000. 800,000 to 1 million: People who need temporary shelter. 300,000: Children younger than 2 who need nutritional support. $1.12 billion: International aid pledges. 300: Aid distribution sites that are up and running. 130-150: Aid flights arriving every day on Port-au-Prince’s single runway. 50+: Aftershocks of magnitude 4.5 or higher. 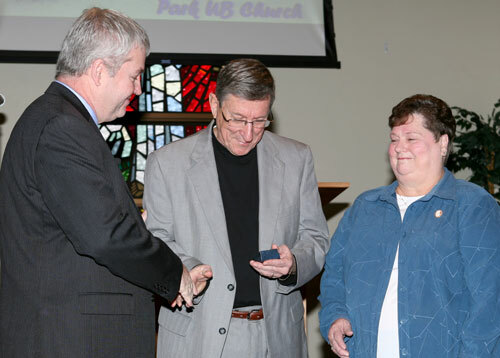 Bishop Phil Whipple (left) presents a retirement pin to Larry Taylor, as Larry's wife Linda looks on. 1972-1986: Zanesville UB (Zanesville, Ind.). 1986-1999: Good Shepherd UB (Huntington, Ind.). 2000-2011: Park UB (Bluffton, Ind.). Before joining the United Brethren denomination, Larry pastored Evangelical United Brethren (now United Methodist) congregations going back to 1964.